Can only good design determine worth or is there something else to it? In our next comparison test we pitch Hyundai's latest ‘Elite i20' with Fiat's ‘Punto Evo' to tell you which of these diesels is an ideal money fitting proposition and why? The list is endless in the premium hatchback segment. We picked the top two contenders according to their popularity in the current scenario and also for the simple reason that they have recently been remodelled to provide more appeal so as to lure the individual customers towards themselves. Thus what this all boils down to is well in a price bracket of Rs 5.5 - 8.5 lakh (ex-showroom Delhi). What should one ideally go in, the "Elite i20 with its radical looks or the Punto Evo which offers sportiness. To get things started, having given a brief description of both machines in this particular comparison, we shall first talk about the Elite i20. When compared to its previous generation, its current Fluidic sculpture definitely seems to have taken a bigger leap. This is evident from the way it looks especially the pointed nose and sculpted bonnet that comprises of a hexagonal grille, chrome finished air dams, wrap around headlamps and fog lamps. Rest the side profile remains more or less the same except the blacked out ‘C' pillar which further helps adding character. While the rear has a slightly distinctive tail gate courtesy a set of new tail lights, redesigned bumper with indicator inserts and reverse camera located right in centre just below the Hyundai logo. In contrast, Fiat Punto comes across as more muscular and sporty in appearance. This is due to the manner in which it has been designed, be it the front or the rear. One must say that it attracts a lot of eye balls, especially when on the road. Head on, the Evo brings forward pulled back headlamps with extensions, a chunky chrome highlighted front grille which forms the focal point along with other elements such as chrome surrounded fog lamps and creased bonnet. Its sides remain unchanged apart from the addition of chrome door handles and a set of 16 inch diamond cut alloy wheels which again spruce up the overall look of this hatch. The tailgate now offers crystal clear lamps with LED's which simply look amazing, however if one were to distinguish between petrol and diesel variants there is no way to identify as there is no distinctive batching. Chrome surrounds highlighting the reflector inserts visible within the rear bumper further enhances the design. Well this is one sphere where things really get interesting as it is very easy to get confused between the two. Looking at features, the Elite i20 is definitely a better value proposition in comparison to the Punto Evo. The quality of plastics, fit and finish provided on the Elite is more superior to that of Evo, which has in fact been a deficit on the part of Fiat since the Punto's inception in the Indian market. The i20 caters to dual tone interiors (beige and black) while the Punto offers all black interiors in the all important 90bhp top variant. The instrument cluster on the Elite is similar to that of the Hyundai Grand i10 therefore there is not much of a change. However the availability of sporty dials on the Evo does help remind the user of its pedigree. Centre console available on both these hatches is very different from each other. Punto Evo in this regard is a bit more appealing than the Elite i20 due to its ‘Piano Black' finish that adds a premium feel to it. Features such as automatic climate control, Blue & Me technology grace the Punto along with things like CD/MP3, Aux-in, Bluetooth Connectivity and voice recognition. Elite on the other hand offers a 2 DIN MP3 music system with elements such as Aux-In, USB port, Bluetooth connectivity, automatic climate control apart from a ticket holder which is a first for this hatch and also an air cooled glove box. Both cabins provide ample of storage space be it a sunglass holder or cup holders they are all present for maximum utilisation. Before moving onto comfort, we would like to mention that both cars cater to key less entry however the Elite i20 provides a Start Stop Button for convenience which still non-existent on the Punto Evo. One would have really liked to see this feature on Fiat too. Pretty well upholstered, the i20 comes loaded with dual tone fabric while the Evo with its black fabric with red lining and stitching feels really sporty. In regards to head, shoulder and leg room both hatches are at par with each other though one does try to differentiate on the basis on under thigh support but there too they both are pretty similar. Somehow the rear seat of the Hyundai did seem a bit more comforting in comparison to the Fiat. The number game begins here and the all important points to be considered would come out of this section. Before we begin, let us remind you that both these hatches are mere upgrades, therefore mechanically they remain unchanged. Hyundai Elite i20 thus provides a 1.4 U2 CRDi power plant visa-via Fiat Punto Evo which is powered by the world renowned 1.3 litre Multi-jet Diesel engine. Power figures state that the i20 Elite diesel produces 89 horses with 220 Nm of peak torque in comparison to Punto Evo diesel which churns out 92bhp with 209 Nm of torque. By now it would be clear that the i20 has a slightly bigger engine capacity in comparison to the Evo, however their power is pretty similar while torque has a difference of 11 units which comes out in the way they perform on the road. Therefore the new i20 when driven seems to be more refined out of two due to its linear acceleration while the new Punto does have a bit of lag especially lower down the revs. The NVH levels are on the higher side in case of the Evo when compared to the elite. Transmission, well this is another segment wherein there is a vast difference between the two. Elite i20 for that matter is catered by a 6-speed manual transmission that works exceptionally well to hand out perfect shifts while the Punto Evo only has a 5-speed manual gearbox that provides just about decent shifts. The reason why we are saying this is because the gear stick at times does not slot in properly resulting in inefficient shifts. The stiff ride quality on the Punto allows jerks to travel down the spine but it can be overlooked by the way in which handles. Be it a turn, corner or curve, the Punto Evo does well to keep the confidence alive within the driver. On the other hand, the Elite with its softer ride is able to impress its occupants but somehow loses out a bit on handling due to its lighter rear end which tends to snap especially when thrown around at turns, corners and curves. Coming back to our earlier question, can only good design determine worth or is there something else to it? The answer to this question is well, a yes and no. The reason for this is that looks in today's context are an important determinant for choosing the right set of wheels but performance is also something that requires a bit of analytical approach. 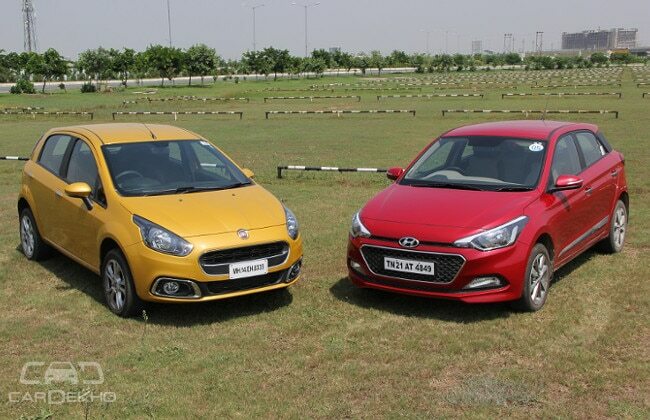 So therefore considering their respective exterior design, Hyundai's Elite i20 is a bit more radical looking out of the two and has in fact touched the taste buds of the average consumer while Fiat's Punto Evo has loads of muscle to offer that would be well received by sheer enthusiasts. The features list is unlimited in the i20 while Evo gets restricted with a few modern updates. Power output is somewhat similar but when it comes to on road performance, the Elite i20 is the ideal pick simply because of refinement, however we would not like to leave out the Punto Evo as it is pretty fun to play around with only if you are an enthusiast that it.